Whenever a Pakistani media outlet publishes the map of Pakistan, it makes an effort to ensure that Azad Jammu and Kashmir as well as Gilgit-Baltistan are included in the country’s territory. The two regions are also an integral part of Pakistan’s commercial and economic markets: goods, services and people travel from Punjab, Sindh, Khyber Pakhtunkhwa and Balochistan to Azad Jammu and Kashmir and Gilgit-Baltistan – and vice versa – without any border controls and taxation. Sost, one of Pakistan’s busiest trading posts with China is located in Gilgit-Baltistan and the Neelum-Jhelum Hydropower Project, one of the largest electricity production projects in the country is being built on the confluence of two rivers in Azad Jammu and Kashmir. Pakistan’s constitution, however, does not so much as mention Azad Jammu and Kashmir or Gilgit-Baltistan. And yet, in a twist of irony, residents of the two regions are subjected to all taxes — including income tax, which all Pakistani citizens have to pay. Here, the Herald explains some such inconsistencies. Pakistan’s territory does not include Azad Jammu and Kashmir and Gilgit-Baltistan. Yes, but the door is left open for them. Under the 1973 Constitution, the territories that comprise Pakistan are “the Provinces of Balochistan, Khyber Pakhtunkhwa, Punjab and Sindh; the Islamabad Capital Territory… [and] Federally Administered Tribal Areas.” The country’s territorial limits also include “such states and territories” that are already included in Pakistan “whether by accession or otherwise”. There is clearly no mention of Azad Jammu and Kashmir and Gilgit-Baltistan among the constituent parts of the country. Yet the two regions are entirely dependent on the government of Pakistan for all their financial and development activities as well as in matters of defence, economy and foreign policy. This dependence derives its legitimacy from various agreements made between the government of Pakistan, the rulers of small principalities in Gilgit-Baltistan and the leaders of the Muslim Conference, a political party in the pre-1947 princely state of Jammu and Kashmir. Those agreements emerged after the 1948 war between India and Pakistan led to the division of the princely state into two parts — one controlled by India and consisting of areas such as Jammu, Srinagar and the surrounding valley, as well as the Buddhist region of Ladakh, and the other controlled by Pakistan and consisting of areas such as Mirpur, Muzaffarabad, Neelum Valley and Gilgit-Baltistan. The two regions are entirely dependent on the government of Pakistan for all their financial and development activities, as well as in matters of defence, economy and foreign policy. “Azad Jammu and Kashmir and Gilgit-Balistan have special relations with Pakistan,” says Idrees Abbasi, law secretary of the Azad Jammu and Kashmir government. Originally, Azad Jammu and Kashmir and Gilgit-Baltistan were a single territorial unit. In 1970, the latter was separated from the former and renamed as the Northern Areas. Political and community leaders in Gilgit-Balistan have been demanding for decades that their region be integrated into Pakistan, but successive governments in Islamabad have resisted those demands. The integration may give the signal that we have accepted the de facto division of Kashmir; it will weaken our claim on the entire former state of Jammu and Kashmir — this is how the Pakistan government justifies its decision to keep these regions outside the constitutionally-mandated parts of Pakistan. The Constitution, however, provides that Pakistan’s geographical limits are not final yet. These, therefore, include areas which in the future may join the country “whether by accession or otherwise”. These are self-ruled autonomous regions. On October 24, 1947, politicians based in what became Azad Jammu and Kashmir formed a war council with the support of the Government of Pakistan, says Abbasi. The council was headed by Sardar Muhammad Ibrahim, the leader of a political group which resisted Jammu and Kashmir’s controversial accession to India. This war council worked as the government of the Pakistani-controlled region for all political purposes. “In the system, which prevailed from 1947 to 1960, the person holding the confidence of the working committee of the Muslim Conference (the Kashmir-based political party that supports the region’s accession to Pakistan) was nominated as the president of Azad Jammu and Kashmir,” reads the website of Azad Jammu and Kashmir Legislative Assembly. In 1960, a 24-member state council came into being. This was to be elected by union councillors who were in turn directly elected. The councillors were also to elect the chairman of the state council who would be the president of the region. With some variations, this system continued for the next decade. In 1970, after the Northern Areas were separated, a new form of government was introduced in Azad Jammu and Kashmir. Under this system, the 24-member state council as well as the president of the region were to be directly elected through adult franchise. The system also provided that the central government of Pakistan was to be responsible for three subjects: implementation of the resolutions by the United Nations Commission for India and Pakistan (UNCIP), foreign affairs and defence. “But Islamabad disbanded the new system as the military government at the time did not like the assertive attitude of the Azad Jammu and Kashmir government,” says a senior member of Azad Jammu and Kashmir legislative assembly, on condition of anonymity. In 1974, an interim constitution was promulgated, which provided a partially parliamentary form of government for the region, with a bicameral legislature. Under this constitution, the first legislative chamber is an elected house: the Azad Jammu and Kashmir legislative assembly which in turn elects a prime minister; the second chamber is the state council which includes the region’s president and prime minister and three members of its legislative assembly but is dominated by nominees of the government in Islamabad. The prime minister of Pakistan is its chairman. No law can be passed and implemented in Azad Jammu and Kashmir unless it is ratified by the state council. The last and most powerful tier of this system is a federal ministry that oversees all the administrative (including appointment and transfer of senior bureaucrats, judges and policemen) and political activities, such as the holding of assembly and council sessions and the passing and allocation of the budget. Subjects such as defence, security, foreign affairs and foreign trade, currency and coins are exclusively the responsibilities of the Government of Pakistan under the interim constitution, according to the legislative assembly. Islamabad also has the power to appoint the president of Azad Jammu and Kashmir who serves as the nominal head of the state. The Government of Pakistan has the power to appoint the governor of Gilgit-Baltistan. Most important subjects, in any case, remain out of the purview of the regional government and legislature. In 2009, the Government of Pakistan renamed the Northern Areas as Gilgilt-Baltistan and promulgated an ordinance to provide for self-rule. The ordinance resulted in a 33-member Gilgit-Baltistan legislative assembly elected through adult franchise. The assembly then elects a chief minister. The other institution established by the ordinance is the Gilgit-Baltistan Council, headed by the prime minister of Pakistan and dominated by members nominated by Islamabad. It has the final authority to pass or reject laws. As in the case of Azad Jammu and Kashmir, the Government of Pakistan has the power to appoint the governor of Gilgit-Baltistan. In any case, the most important subjects remain out of the purview of the regional government and legislature. The newly-appointed governor of the region, Birjees Tahir, is a member of the National Assembly from a central Punjab constituency, besides being a federal minister. The chief election commissioner appointed earlier this year to hold Gilgit-Baltistan legislative assembly elections, Justice (retd) Tahir Ali Shah, has been a judge of the Lahore High Court and is alleged to be affiliated with the ruling Pakistan Muslim League–Nawaz (PMLN). Although the systems of government in Azad Jammu and Kashmir and Gilgit-Baltistan look more or less the same (both have limited levels of autonomy and are entirely dependent on the Government of Pakistan for financial resources), people in the latter region feel that those in the former are still getting a better deal. “There is growing realisation among the political elite [in Gilgit-Baltistan] that our government does not get the level of constitutional protection enjoyed by the one in Azad Kashmir,” says Jamil Nagri, a reporter in Gilgit-Baltistan. “The government in Islamabad should not be able to pack up the self-government system in Gilgit-Baltistan as and when it likes,” he adds. Officials in Azad Jammu and Kashmir say their self-rule is just as illusory as in Gilgit-Baltistan. “Since we are not a part of the federation of Pakistan, we do not have the right to demand financial resources as a matter of right,” says a senior Azad Jammu and Kashmir government official. “These financial resources are given to the regional government only as special grants and their continued flow is totally dependent upon the whims of the government in Islamabad,” he adds. The two regions have representation in Pakistan’s legislature. According to the 1973 Constitution, Pakistan’s federal parliament – the National Assembly and the Senate – shall consist of members who are the citizens of those areas which are constitutionally part of Pakistan and are elected from those territories. Azad Kashmir and Gilgit-Balistan are not part of Pakistan’s territories constitutionally speaking, so they don’t have any representation in the federal parliament. Yet, Pakistani political parties and leaders figure very prominently in the politics of the two regions. In a by-election held in late March 2015 in Mirpur for the Azad Jammu and Kashmir legislative assembly, the winner, Barrister Sultan Mehmood, was running as a nominee of Pakistan Tehreek-e-Insaf (PTI) and his rival, Muhammad Ashraf, belonged to the Pakistan Peoples Party (PPP). Even Muttahida Quami Movement (MQM), which otherwise is confined to just Karachi and Hyderabad, has representation in the Azad Jammu and Kashmir legislative assembly. Similarly, all major Pakistani political parties, including the ruling PMLN, are fielding candidates for the Gilgit-Baltistan legislative assembly elections scheduled for June 8, 2015. Pakistan’s superior courts have jurisdiction in the two regions. No. They have their own judicial systems. The judicial system in Azad Jammu and Kashmir is different from that of Pakistan. “There are Islamic courts which deal with criminal cases. Trials take place in these courts according to Islamic law,” says Abbasi. “For civil cases, however, we have a judicial structure similar to the one in Pakistan,” he says. The forum for appeal in criminal cases is the Shariat Court; in civil cases, the region’s high court is the appeal forum. 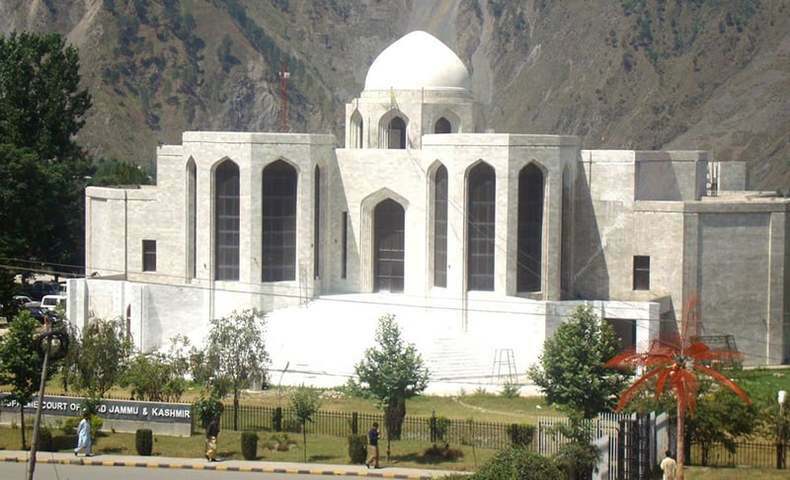 The Supreme Court is the highest judicial forum in Azad Jammu and Kashmir which not only hears appeals against the decisions of the judicial forums below but also has the authority to adjudicate over constitutional and human rights issues. Since 1993, the chief justice of the high court has also been acting as the chief justice of the Shariat Court. The Supreme Court and the high court in Azad Jammu and Kashmir were constituted under the region’s interim constitution. The Shariat Court was set up as a result of a law passed by the Azad Kashmir legislative assembly in 1993. Azad Kashmir and Gilgit-Balistan are not part of Pakistan’s territories constitutionally speaking; so they don’t have any representation in the federal parliament. Even though Pakistani laws don’t apply in Azad Jammu and Kashmir and the writ of Pakistani courts doesn't extend to the region’s territories, the government in Islamabad has the power to appoint judges in a large part of the superior judiciary there (though the choice is restricted through a nomination process conducted by the chief justices of the region’s Supreme Court and high court). In the Shariat Court, however, the judges are appointed by the prime minister of Azad Jammu and Kashmir, says Abbasi. The district and lower courts in Gilgit-Baltistan are quite similar in structure and functions to those established in Pakistan. A 2009 federal law has set up a Supreme Appellate Court there as a forum for appeals in all cases. Unlike the Supreme Court in Azad Jammu and Kashmir, however, it does not have the power to review laws passed by the region’s own legislature. The appointment of all three of its members, including its chief justice, is made by the prime minister of Pakistan without having to consult anyone. Among many other things, this is one major reason for Gilgit-Baltistan’s elite to complain that their region does not have the same degree of self-rule that Azad Jammu and Kashmir has. "Pakistan’s territory does not include Azad Jammu and Kashmir and Gilgit-Baltistan" because its still a disputed territory, under UN protocol, which India claims. Crux here: They have independent judicial system and have an independent electoral system. Yes, their council can't make legislation but they could adopt or reject any federal law if it doesn't suit their regional prosperity. But Pakistan's stance of not integrating it completely in the Federation based Kashmir dispute is complete a farce. The integration of GB and AJK could not affect Pakistani claim over Kashmir. Who gave such pathetic ideas? @Sunil Neither Indian territory including Jammu, Kashmir valley and Ladakh belongs to India as it is disputed area under UN resolution claimed by Pakistan. And now i can tell my Pakistani friends, those who have been arguing about Kashmir being part of Pakistan: 'Azad Kashmir and Gilgit-Balistan are not part of Pakistan’s territories constitutionally speaking;' Thank you for publishing this great piece of information. So what is news here - this stuff has been the same for decades. @Sunil Its not about what India or Pakistan claims, its about what do people of these regions want. I think its a time for UN, India and Pakistan to reconsider their policies. Ladakh is not a Buddhist region as claimed by author. Ladakh is a region consisting of Leh and Kargil districts of Indian occupied Kashmir. The population of Kargil is entirely Muslim and Leh with a very small population is Buddhist. Collectively, the populations of Muslims far exceeds the populations of Buddhists in the Ladakh region. India has been trying hard to sell Ladakh as Buddhist and here they have a pakistani buyer!!!! Gilgit and Baltistan, along with Ladakh and Jammu and Kashmir itself, were part of the territories of the Maharajah at independence and the war of 1948. They are all therefore in dispute and their final status will not be settled until Pakistan, India and the people of these territories, come to an agreement. That agreement almost certainly will require a vote of the people of each territory as to which country to join and under what terms. Reunification of J&K, G-B and Ladakh will certainly be an issue, as will free travel and business between Kashmir, G-B, et al., and India and Pakistan both. On balance, the people of Indian-held J&K&L appear to have more real self-government than the people of Pakistan-held AK and G-B.
" Muslim Conference, a political party in the pre-1947 princely state of Jammu and Kashmir. " Factually wrong! The founder of the Muslim Conference, Sheikh Mohammed Abdullah, changed its name to National Conference long before 1947. So, if there is a Muslim Conference in Ghulam kashmir, it is a local invention post-1947! I can settle this, has an India flag ever been flown in Azad Kashmir and Gilgit-Bulistan? Has the Pak flag been ever flown in Indian occupied Kashmir, this shows what the people want. Matter closed. It boils my blood when I think of the time when our politicians agreed on the cease fire and thought India will give the right of referendum to the people of Kashmir. Had we carried on with the fight the whole Kashmir would have been Azad Kashmir as we were progressing successfully. Stupid politicians and UN. @Humshah All I can say as a Kashmiri reading all these vile comments is thank you! I will not see a resolution of kashmir in my life time or my grand childrens life time. Its more than 65yrs, these two nations had been fighting over this. If these nations would have settled their differences, they would have been counted as one of most power full countries in the world with so much potential for trade and economic developement as well as posessing so much talent. Lets settle, they keep their part and we keep our part, shake hand, and move on a freindly terms, taking care of poverty and developement of both the countries. But thats a dream with so many hot heads justifying the current position on religious and other grounds. Thanx kindly Umer for the knowledge. However, I've been to both the regions umpteen times for years and never felt as if I was outside of my country ! It may not be on paper (constitution) but those heavenly regions are as much Pakistan as Karachi and Lahore. Longing to be back there, where at the first time there I said these two words....(wow) "God's Exaggerations"
As for as the matter of Gilgit Baltistan is concerned, instead of giving it the autonmy,and to settle down a seperate supreme court, it can be taken under the full control of Government of Pakistan by giving them representation in National assembly and senate.As from the last people's part govt time GB can have its own Chief Minister,in the same way these people should have representation in Central Government. If GB is not part of Pakistan then why Lalik Jan Shaheed is awarded with the highest military award of Pakistan? According to Self Rule Ordinance 2009, the people of GB have the right to be governed by a GB citizen then why a man from Punjab is Governor GB? The people of GB don't elect Prime Minister of Pakistan nor the Minister of GB & AJK, then under which law they rule over the people of GB? Why the people of GB don't get royalties of rivers, mountains, minerals, gems, forests & tourism? The bureaucratic rule in GB should end now and political rights and basic human rights should be given to the people of GB now as no other province is more patriotic & loyal to Pakistan than Gilgit Baltistan...The Jewel of Pakistan. Writer has nothing better to do just to entice the non issue to destabilize the region. Where people in these area are happily living their lives.. This news shouldn't be publicize for no reason. India includes entire J&K state leagally because of the accession agreement with Maharaja of J&K.